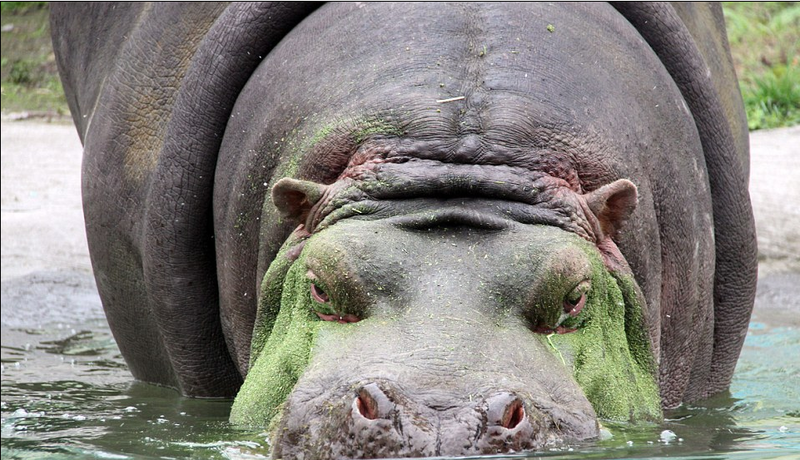 This Hippo Suddenly Became Angry.. But When this Man Came, Everything Has Changed! A dentist’s job is not an easy one, staring into the mouths of dozens of patients on a daily basis is enough to put anyone off their breakfast, lunch and even dinner. But imagine if that patient was a big hippopotamus. 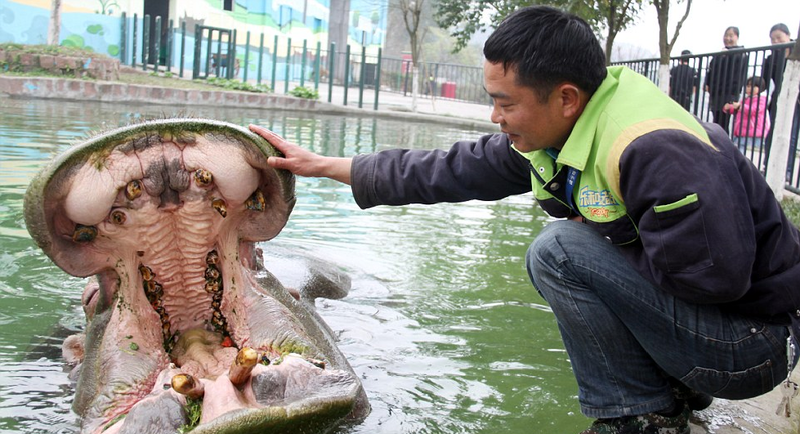 This was the case for one zookeeper in China who took the job of a dentist to a new level. 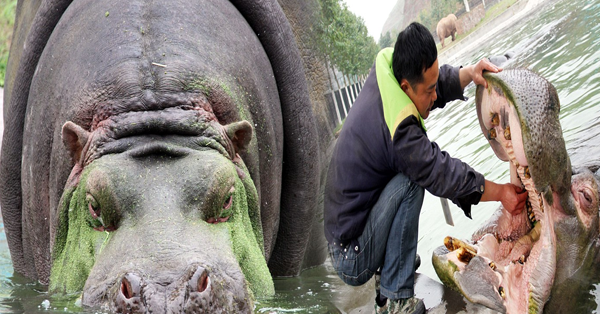 He was tasked with putting his hands into the huge snapping mammal's mouth and cleaning out grass residue from its massive teeth after the animal allegedly swam toward him for help. 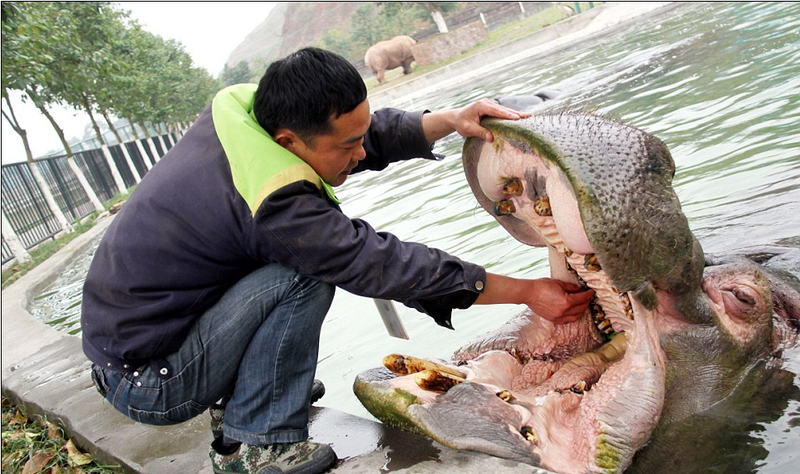 The man was pictured flossing the powerful herbivore at the Wild Animal World in the Yongchuan District of Chongqing. 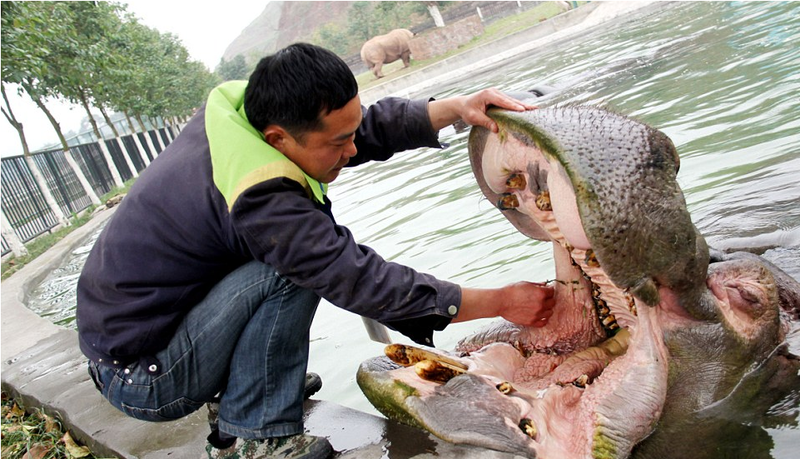 The hippo was reportedly not feeling well after a meal with vegetables stuck between its teeth that needed to come out. It was behaving anxiously before it swam to the shore of its enclosure and opened wide for the zookeeper. Immediately the man crouched down and stroked its nose before cleaning out the grass residue in between its huge teeth. He scrubbed away the teeth until they were clean. It was a risky job for the man at the zoo considering the hippo is considered as one of the most feared animals in Africa, with a bite force that measures a whopping 1,821 pounds per square inch. Although they may look cute and friendly, they are extremely aggressive and easily frightened by people. After the breeder cleaned away the grass from its teeth, he was relieved and went back into the water. Although hippos are regarded as dangerous animals, when they are kept in custody they are used to having a bit of pampering every now and then.